If you read Beyene Haile’ book and feel that you do not understand anything, whose problem is it? Is it going to be yours or his? With all the acclaim and prominence he got from his last two books – Dikuan Tiberh and Titsbit Bahgu – many have frowned when they reached the last pages of his book. His last two books have not been everyone’s cup of tea merely because many are used to reading stories mounted on twists and turns of plots and plain wording of sentences. One cannot pick out a single theme and consider oneself to have fully captured what the work is all about. In addition to that, the leaflet advised that audience should follow the play naively lest they find it difficult to follow if they try to associate what they know with what they watch. It also indicated that the play would differ from a conventional play. The prologue of the play tunes the audience in similar manner. It certainly has distinct features of presentation, subject and acting, though it fulfills some traditional theatrical conventions. The setting being the main street at downtown Asmara at this time, characters debate on numberless subject matters. It has no plot that keeps audience in suspense and a conflict for which they would expect a resolution. The opening scene of the play hooks the minds of audience up to it instantly. The actors raise various topics and debate non-stop. At times they ask one another what the audience would think. Again at some point in the middle of the play an actor from the middle of the audience complains saying that he does not like a drama without any conflict. In addition, some of the songs which are part of the play expect the audience to response as part of the chorus. This technique seems to enable the playwright to involve the audience in an interactive way in the making of the drama. There are very elaborate changes of scenes. 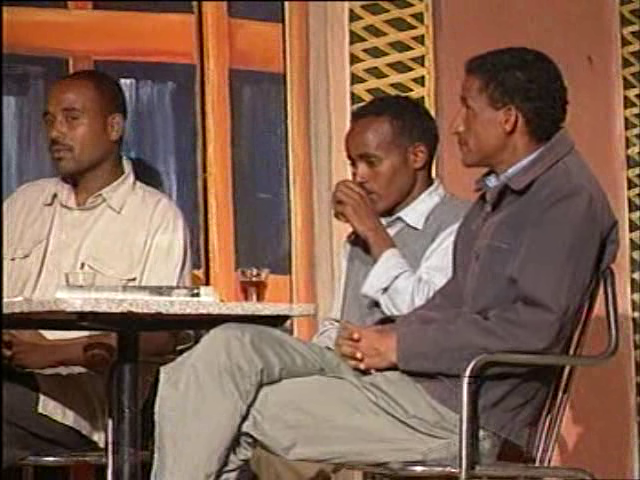 Although there is a wonderful stage design depicting one of the cafés and the main street in downtown Asmara, almost no change of scenes exist. 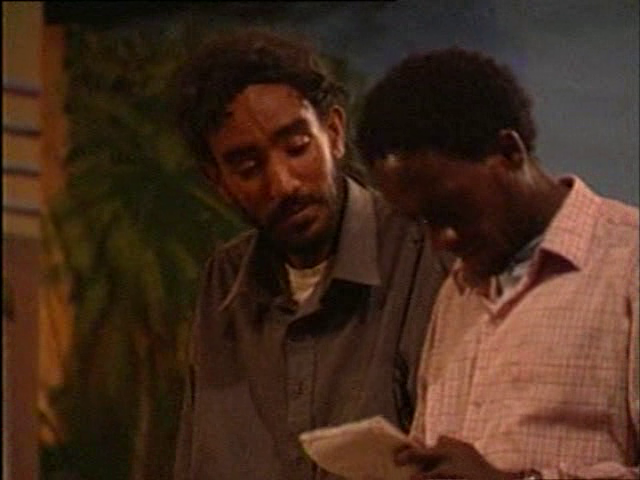 By doing so, the audience would easily make out the actors as they are discussing in the street similar to the always busy street in Asmara. The characters do not have any special costume, nor there is a main character. It could also be said that there is no clear character development within them; for that matter one may not be able to sketch out their characterization. However, the most important thing is that when the characters debate, they sway the audience from one tree of idea to another taking turns. The play is performed by nonprofessional actors. Considering the length of parts they studied and performed, they were really impressive. One would think they were actors by profession. Their stunning performance shows how hard they had worked in their seven month-long rehearsals and commendable efforts on the part of the director. Taking into account the nonexistence of plot or rejection of a cause-and-effect realistic structure as well as characters that one does not find much difference between one another, the work, irrespective of its philosophy, could be likened with the theatre of the absurd – where a lot of dramatic conventions are broken. In addition, it involves Euripides’ chorus that is independent of the play but which also advances the essence of the play – philosophising and trying to find deeper meaning out of an ordinary life. Therefore, viewed from its structural side, it is an innovative work that cannot be totally linked to only one style. His idea of ‘the stage of perfect or infinite possibilities’ described in his 2003 novel Dikuan Tiberh has been put in practice in the play. We find a female singer who uses awlo – a Tigrigna oral poetry recited spontaneously mostly on the spur of the moment as a stimulus to a certain happy situation usually by men. There are traditional songs as well as modern blended together. 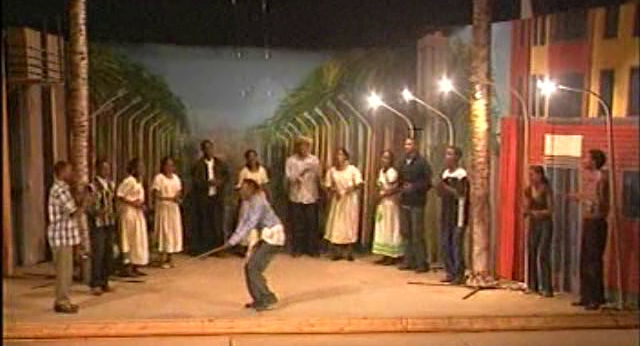 In addition, the group of chorus includes modern young people who try to bring together the two groups debating in the play, which a role traditionally played by elderly people. Thus the idea stated above has been shown in different forms and the whole play audaciously tries to be a witness to it. In Dikuan Tiberh, a character named Tsegai, who calls himself a teacher, says that drama is the best method in teaching learning process. He also thinks that life itself is part of a drama…and it is a bridge of life. However, if one goes to watch the play Weg’i Libi bearing the above in mind, one will only be misled. Although those ideas were put into the minds of the character by him, Beyene does not seem to approve of that himself. There is no instruction one gets watching the drama. Had he intended to do so, one would have expected him to concentrate on a single theme and try to pass it onto the audience through it. 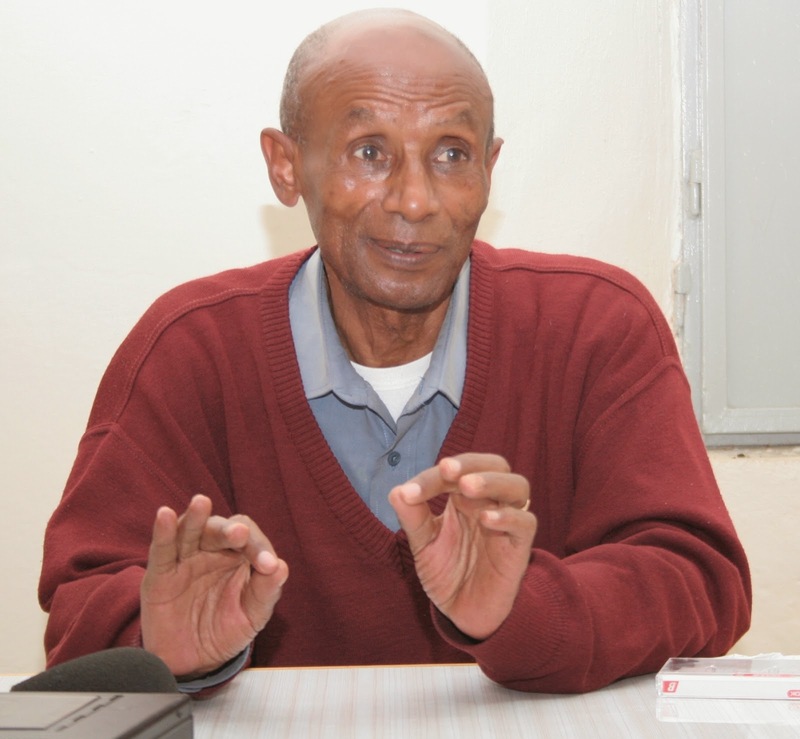 However, Beyene proves it again that his ideals of over 40 years back have not yet changed. In the preface of his first novel Abidu’do Tiblwo published 1964, he had indicated that fiction writers are different from teachers. If they intent to teach, reprimand and lead, they would distance themselves from pure beauty. He also went on that when we talk about [a fiction’s] purpose, it will be about aesthetics. Although the audience has ample opportunity to glean ideas that touch deep in them, the ideas are cocktailed in beauty of art-for-art sake tenet. The play touches numberless topics: internal beauty, women’s place in a society, superficiality of artists, truth, immigration, youth, love, greed… as the list is very long I will only miss out many of them if I said these are all. Many of the ideas are presented in reference with classical ideas of some philosophers expounding the reality at hand. Beyene adds some flesh to what Per Wästberg in his article “The Writer in Modern Africa” stated: “I would suggest one feature in which African literature differs from European literature: it is contemporary…. [Most African works of fiction] document a time of transition. They reflect what is still in the memory of the living.” Acquiescing with this, the play, defying a cause-and-effect realistic structure as described above, presents as characters of ordinary people passing by Harnet Avenue, the main street in downtown Asmara. Those people are presented not as they are but as they should be when they search for something within the depths of their selves. What many consider his works as paranormal does not happen to be so when considered from the above quote. Although ‘mystic presence’ forces him to divulge his inside for us, his words also attest that they are ‘challenges faced in life’. It probably is not right to get close to the play, Heart-to-Heart Talk, with closed mind. As its title suggests, it may require us to open our hearts. As Beyene Haile has once again proved to be a chef of myriad ideas catered aesthetically, let us only pick our favourites for gluttony has its own effects. 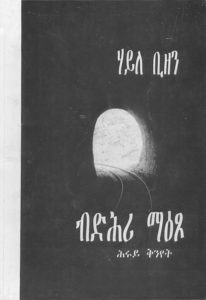 The play was directed by Abraham Tesfalul and the cast included Ghirmay Abraham, Berhane Ghebrehiwet, Fethi Andom, Rezene Tesfai, Zekarias Gherima, Abraham Tesfalul, Yordanos Ghebrezgiher, Jellani Seid, Segen Ghebretinsae, Melles Negusse, Segen Abraham, Dawit Solomon, Feruz Ghebremeskel, and Amauel Mehari. The stage was designed by Demoz Ressom, lighting by Mekonen Sium, and music by Barnabas Mebrahtu.